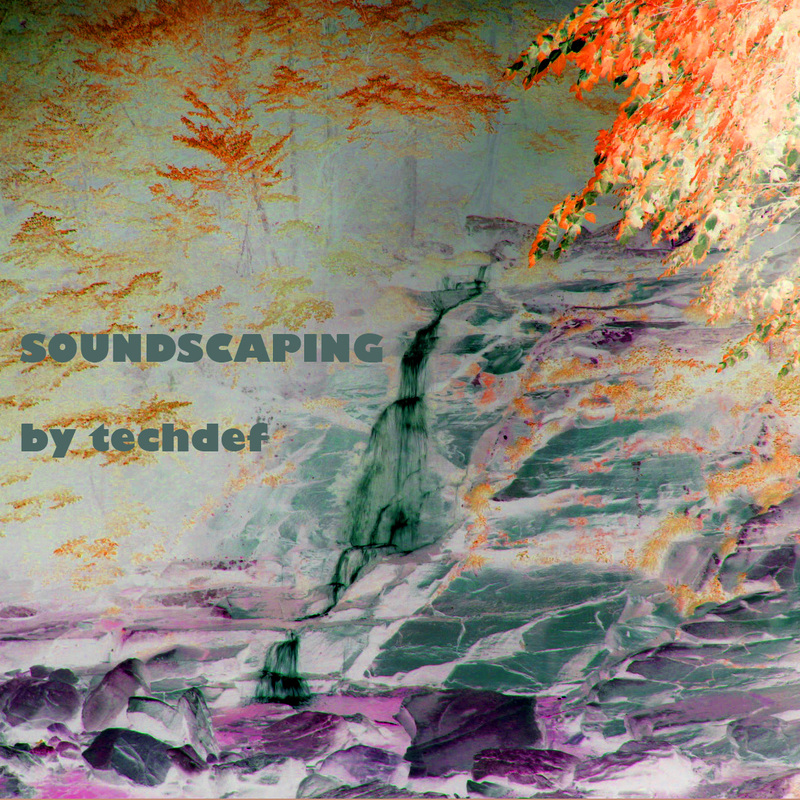 Soundscaping, a sound designer’s mix. A collage of electronic, classical, jazz, spoken word of different types, soundtracks, and sound effects. An incomplete list of the artists included in this mix: Aphex Twin, Autechre, Bill Laswell & Tetsu Inoue, Boards of Canada, Brian Eno, cineplexx, Daniel Carter & Reuben Radding, David Lynch, Delia Derbyshire, Direwires & Freder, Eddie Harris, Edwin Morris, Faust, Funki Porcini, Gil Melle, Gil Scott-Heron, Glenn Gould, Grohs, Jean-Michel Bernard, John Cage, John Lee & Gerry Brown, John Lurie, Journeyman, Kevin Shields, Kraftwerk, Loscil, Marshall McLuhan, Michna, Miles Davis, My Bloody Valentine & Skylab, Neotropic, Nine Inch Nails, Patterns In Plastic, Pink Floyd, Regolith, Sigur Ros, Spectrum, Sun Ra, Surround2011, Techniken Defunkus, The Cinematic Orchestra, The Crane, The Future Sound Of London, The Orb, This Heat, Throbbing Gristle, Tom Waits, Toru Takemitsu, Transcend, Vangelis, Vorpal, We, and woob. It’s a mix without any drums at all. They’re all “ambient” tracks: if that description includes spoken word, classical, jazz, rock, soundtracks, etc. At least two things are playing – in layers – at all times. It gets a bit dense in places. Assembling this mix took me back to experiments I would subject listeners to during the middle of the night at the radio station WCNI, New London. I started working as a trainee at WCNI in the fall of 1992, and hald my own show starting in January ’93. During the fundraising marathon that year, I answered phone lines for a couple of veterans who were doing something they called twisted radio. This sometimes meant playing more than one record at once – but not in a dance music/beat-matching manner. They really didn’t care what kind of collision might occur. Once I got over my initial shock at this (and other antics I witnesses), I found it very freeing, and it inspired me to use my graveyard 3-6 am slot as a laboratory for layering different sounds in all sorts of combinations. Given my overall fascination with collage, this isn’t that surprising in retrospect. One night I do recall playing 4 different copies of a Yes album, all slightly out of sync with each other. This all started before I ever started to do sound design. This kind of experimentation started first. My work as theatrical sound designer started about a year later. I also started to hear some of Negativland’s material around this time – another huge mind-opening experience. But back in the present, or rather in the recent past: I could have kept working on this Soundscraping mix forever. The first version’s multi-track file was last saved Sept 23rd, 2102, but I probably had started a bit earlier. I stopped working on the last version on December 29th, 2012. That version was the fourth ‘revision’ since I had started. Work really began many months before that, as I sorted through my iTunes Library, bought new albums on Bandcamp and iTunes and from Ninjatune.net, and ripped tracks from my cd collection. I somehow did not end up recording any vinyl for this mix–there was already too much to sift through. However I did ask the many musical members of Ninja Tune forum for contributions, and yo can hear tracks by Regolith, The Crane and Grohs representing members of that rather diverse creative community. At the start of 2013 I listened to it for a while, mostly on my iPhone while commuting (and enjoying the continuing “mix” as the sounds around me would blend into the mix as well), and I imagined I’d keep tweaking the mix and perhaps continue to swap out some of the selections. Then I listened to it again this past week and just decided to call it done and get it uploaded already. I had been waiting until I found time to put a proper track listing together. Maybe I’ll still will get around to that – eventually. It’s all put together in Adobe Audition, which was new software for me at the time I started this project. Audition let me drop tracks in as linked files, instead of importing them. This cut down on overall file space for what was already a huge set of files. Audition also let me place unconverted mp3 files as needed, instead of conventing everything WAVs or AIFFs. Reason wouldn’t do either of those things (that’s what I use for music-making and most sound design projects). The little free Pacemaker desktop app I use for some of my music mixes never could have handled all this – only two tracks can be layered at once in Pacemaker I think. In this mix with all the layers and long fades I used a 8-track layout, with often three tracks or more playing at one time. I imagine Pro-Tools would have done nicely, but have never used that, I went with Audition, and found I learned the software much better as a result of the experience. The main interface of Ninja Jamm (shown on iphone 5 here), using both clip and drill modes. 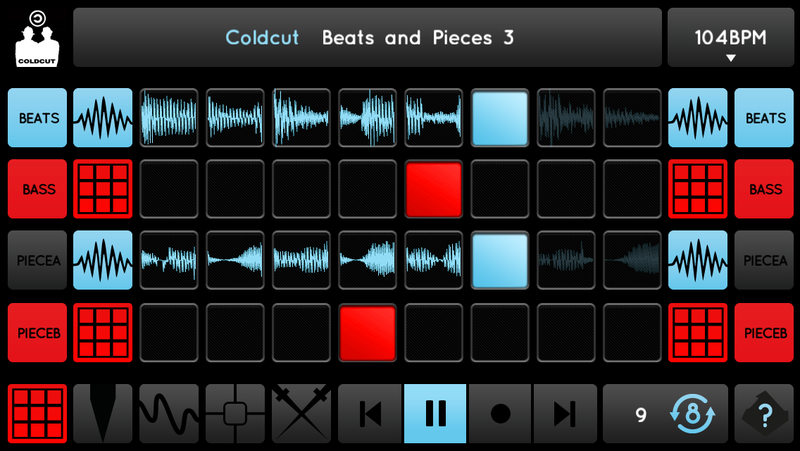 Coldcut’s Beats & Pieces, shown here, comes with the free app when you download it. I love working on various sound and music projects, but can’t find the time to lose myself in music production as often as I’d like. Then I started using the new Ninja Jamm app, developed by Ninja Tune & Seeper, and solved all that. Since downloading the free app, I’ve done remixes on the subway, waiting to get my hair cut, sitting in a café, a taxi, waiting for carrots to cook or laundry to finish the dryer cycle. It has the thrill of an intense but simple arcade game (Pac-Mantronik?) and the temporal/tactile magic of MPC beat-making. Even as I compare it’s interface to a video game, do not mistake NJ for a toy. It’s running full 16bit 44khz sound, versatile and powerful. Each Tune Pack, (all songs by Ninja artists at the moment, with more possibilities expected soon) gives you many sounds to manipulate (41 sounds per tune pack) at a wide array of tempos (from sludge/drone slowness, to fast-forward chipmunk music) with an of different effects, and many different ways to completely remake the songs using the provided ingredients. And this is a live mixing process, there’s no editing or sequencing capability. Rather the focus is on live performance–the result of decisions made in the moment. This makes it a bit closer to djing than the more painstaking process of studio production work. I’ve uploaded over 40 songs in the last month, and each one took less than 5 minutes to make (4:57 is the recording limit of the app, though you may jamm without recording as long as you like). You can then upload your live recording to a Soundcloud account. These files are uncompressed WAV files, and can get up to 50MB in size, so keep that in mind when uploading. Tune Packs also tend to be between 30 and 50MB. You’ll likely want access to either a fast data network or wi-fi when uploading your mixes or downloading the packs. In addition to the free Tune Pack included from Coldcut, there are packs available for purchase ($0.99 each, with two EPS discounted) from Dj Food, Mr Scruff, Two Fingers, Bonobo, Emika, and many more, including a pack from Luke Vibert that is an exclusive song available in no other form. I’ve used other iOS music apps in the past, including Propellerhead’s Rebirth and Figure, but nothing else has been so easy to actully make complete compositions with. Even if you have little or no background in music production, the app comes with an excellent interactive tutorial, and trial and error teaches an inquisitive user all kinds of cool techniques. For more info: updates are posted on the Ninja Jamm website, and the the Ninja Jamm Facebook page. Also I’ve compiled a bunch of links, videos, and reviews over at Stumbleupon. And yes the app is currently iOS only, but and Android version is in the works as are other exciting features. Hard to believe this is only version 1. Well done! It’s particularly well-timed as I’m just starting a new sound design project. 2012 has been quite busy thus far, Musically. Although many of these projects were completed earlier, they’ve only been released this year. There are even more projects still in the pipeline, but I wanted to summarize what’s just recently come to light. I was flattered to be asked to remix Kelp’s track Clear Off, as one of seven people who ended up doing so. The original, and all the remixes were released in late march as an EP on Bandcamp by the 64 bar music label: Clear Off Remixes It’s fascinating to me to hear how many different directions producers take with the same material. There’s another remix project with a twist coming out soon with some of the same people involved. Stay tuned! and Wilco used a piece most famously. Then I heard the same snippet from the Stereolab track on this Mocean Worker song: watch and listen to ‘Earth’ by MOWO I never knew what these were or that they had been compiled like this until asking Adam Dorn (aka Mocean Worker) yesterday — who said it was the sound collagist and hip-hop renegade Steinski who tipped him off to THE CONET PROJECT! Numbers Station use a small girls voice? Odd, beautiful, puzzling, hypnotic, disturbing. Worth sharing. Creative Commons licensed for non-commercial use. Wilco had to go to court for their use apparently.